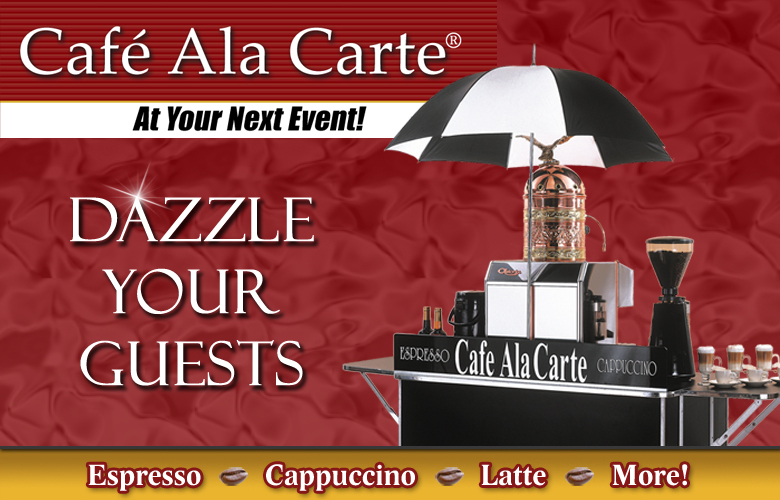 Dazzle Your Guests with the total upscale espresso and cappuccino experience for any event! Offer your guests a delicious espresso, cappuccino or latte served by our professionally dressed baristas directly from a beautiful espresso cart. Add that special touch to your event! Café Ala Carte is south Florida's premier espresso and cappuccino catering service, offering a total sensory experience since 1996. Imagine your guests' delight when they find their favorite specialty coffee drink, custom made to their liking, awaiting them at your next event. Our service and presentation ensure a memorable experience that brings impact to any function! Whether a breakfast meeting, holiday party, wedding or convention, we can accommodate any size group.